Hello Scrapping Cottage friends! Thanks for taking the time to stop and visit today. We are sampling DT cards from the brand new Black Friday Release Bundle. 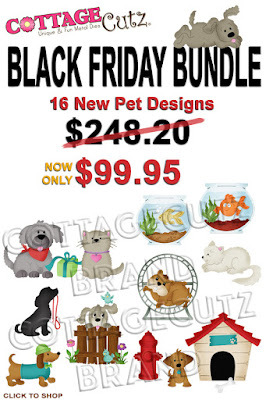 There are 16 new pet designs in this release. And for a limited time the individual dies are on sale at 30% off. Or you can purchase the entire release for $99.95 and you will save 60%. For the next several days, we will be featuring samples from the design team using these new dies. We wanted to give you some creative ideas for using the dies. So let's get started with the cards for today. 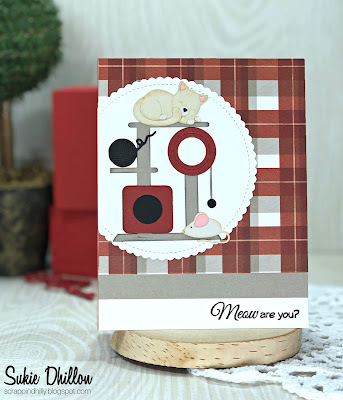 Card 1: Our first sample today is from Sukie Dhillon, our new guest designer. She is featuring the Fancy Feline die. She created such a fun card with this whimsical new die. Don't you just love how the adorable cat is nestled on top of her own kitty condo. The ball of yarn and tiny mouse add a fun element to the scene. She framed the images with the Nested Stitched Scallop Circle die. This card is the perfect way to say hello to the cat lover in your life. Her sentiment completes the theme of the card so perfectly. Card 2: Our next sample is from Lois Bak. She created a cute birthday card featuring the Doghouse w/Pup & Hydrant die. She placed the puppy in a fun outdoor scene using patterned paper for her sky and grass. The picket fence just adds to the overall appeal of her card. Did you notice how she personalized the plaque on the dog house by stamping a witty sentiment. This card design would be ideal for children or adults who may be celebrating a birthday. Card 3: The final sample for today is one that I (Mary Marsh) created using the super cute Peeking Puppy die. I also created an outdoor scene for the lovable little pup. His little friendly face would put a smile on anyone's face when they open this card. He looks like he is so eager to give some love. So I thought a sending hugs phrase was so appropriate for this card of encouragement. The sending hugs sentiment is from a previously released die. Well, that's our samples for today. I hope the team has given you some inspiration if you already bought these dies. And if you are contemplating a purchase, don't wait to long, The dies are on sale for a limited time. Stop by again tomorrow for more team samples. I love all three of the cards! These new dies are just so incredibly cute! Wow, these are super cute cards ♥♥♥! Adorable cards! I'm loving the new die release, they are so super cute! Adorable cards everyone! Can’t wait to see all the samples this week! Aren't these perky pets just too cute?! Sukie and Mary, your cards are adorable. I love that plaid paper, Sukie! Wonderful cards! This dies are so adorable and you used it so well. Congratulations on Your New Fur Baby!